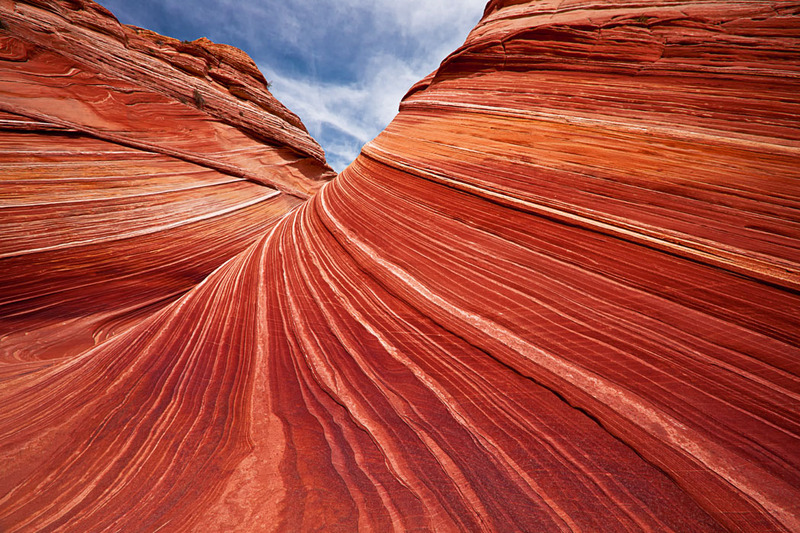 This amazing rock formation, aptly named "The Wave," is located in the North Coyote Buttes region on the Colorado Plateau, near the Utah and Arizona border. Nearly 200 million years ago, this region was a huge desert where sand dunes migrated across the landscape driven by seasonal winds. Today, the hardened ancient Navajo sandstone resembles deformed pillars, cones, mushrooms and other odd natural sculptures. Deposits of iron claim some of the responsibility for the unique blending of colors twisted into the rock that creates a dramatic rainbow of pastel yellows, pinks and reds. The soft sandstone of The Wave is fragile, and any visitors must tread carefully to prevent breaking and destroying the small ridges. In an effort to protect and preserve this natural wonder, access is only permitted by a special lottery system operated by the Bureau of Land Management.